A heavily damaged family Bible requiring paper repair, resewing and restoration of the leather binding. Book repair and restoration requires extensive skill with a wide variety of materials and techniques. 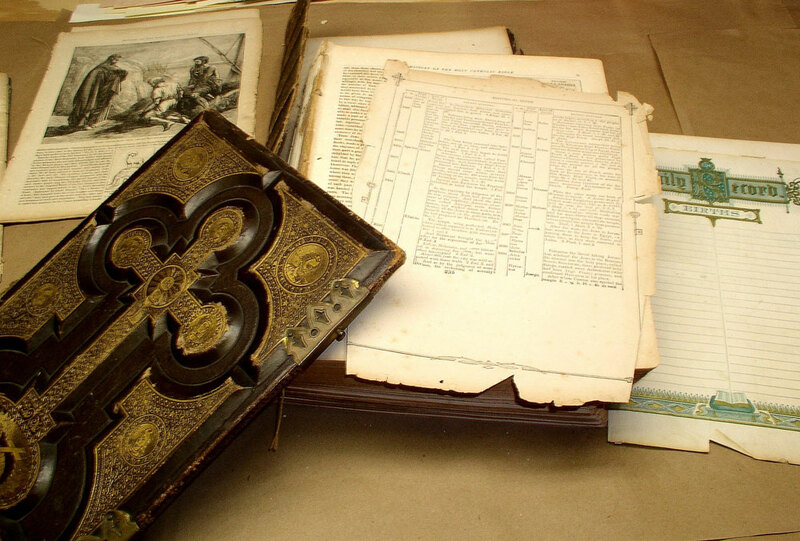 In addition, the binder who undertakes repair and restoration must have knowledge of how books were constructed in different places and times. And lastly, he or she must have comprehensive experience to be able to complete the work with assurance. There are no second chances. Throughout book history and across the landscape various materials and methods have been used to assemble pages into a bound book. While they all share some basic characteristics — pages (most often) sewn together and covered with some sort of material — there the similarities end. Sewing methods, covering techniques, and decorative styles each have innumerable variations. Then there are the varieties of leather, cloth, paper and vellum to consider. For over 30 years we have been binding, repairing and restoring books and paper. Through that time we have acquired the knowledge and skills to be able to complete repair and restoration of your books with confidence. We will examine your books, consult with you as to possible and beneficial courses of action (or restraint) and provide you with an estimate of cost for the work to be done. You can send us a message of inquiry, as well as a photo, on our contact page.